GIANT'S CAUSEWAY (USA) (Chestnut 1997-Stud 2001). 9 wins-3 at 2, Royal Ascot St James's Palace S., Gr.1. Sire of 1940 rnrs, 1291 wnrs, 180 SW, inc. Shamardal (Chantilly Prix du Jockey Club, Gr.1), Take Charge Brandi, Kung Fu Mambo, Giant's Steps, Dalkala, Rite of Passage, Aragorn, Our Giant, Carpe Diem, Giant Oak, First Samurai, Brody's Cause, Ghanaati, My Typhoon, Swift Temper, Blueridge Mountain, Book Review, Creative Cause, Imagining, etc. Andrea Mantegna (c. by Giant's Causeway). 4 wins. See below. The Lincoln Lawyer (g. by Lawman). Placed at 2 in 2017 in GB. Araca (f. by Elusive Quality). Placed at 3 in 2017, 3d Curragh Irish Stallion Farms Fillies S.
ADVENTURE SEEKER (Bering). 2 wins. See above. Along Again (Elusive City). Winner at 2, 2d Windsor Toteexacta at Totepool.com 2YO S., 3d Ascot Princess Margaret S., Gr.3. American Artist. 5 wins-1 at 2-from 1400m to 2050m to 2017-18 in GB and Bahrain, Sandown Share.com Invest With Confidence H., Doncaster Park Hill Private Hospital S., 2d Doncaster Mott Macdonald Bentley H., 3d Newmarket Silver Cambridgeshire, Doncaster Sunbets.co.uk H.
Prime Time. 2 wins at 1800m in 2017, 2d Chantilly Prix Artus, Prix du Parc Laversine, Saint-Cloud Prix de Blanquefort, 3d Chantilly Prix de la Route Ronde, Maisons-Laffitte Prix de Nanterre. ALONG ALL (Mill Reef). Joint Second on The 1988 French 2YO Free H. Joint Third on The 1988 Europe 2YO Free H. . 2 wins-1 at 2-at 1600m, 2100m, Longchamp Prix Greffulhe, Gr.2, Prix des Chenes, Gr.3, 2d Longchamp Grand Criterium, Gr.1. Sire. ARNAQUEUR (Miswaki). 3 wins-1 at 2-from 1600m to 2400m, Longchamp Prix Lord Seymour, L, Chantilly Prix de Villebon, Maisons-Laffitte Prix Santoi, 2d Longchamp Prix d'Hedouville, Gr.3, 3d Chantilly Prix La Rochette, Gr.3, 4th Longchamp Prix Greffulhe, Gr.2, Saint-Cloud Prix Vulcain, L. Sire. THUNDER DOWN UNDER (Street Sense). 4 wins from 1400m to 2100m, NZ$102,435, A$12,850, to 2016-17, ARC 3YO Salver, L, Whangarei RC Fell Engineering H., ARC Bestaff H., Waikato RC Munns the Man's Store H., 3d ARC Bonecrusher S., Gr.3, 4th CJC Armadillo S., L.
Asolo (Surumu). 4 wins from 2050m to 3600m, 953,000fr., 139,200Dm., 37,500Dhs in France and Germany, 2d Deutsches St Leger, Gr.2, Cologne Gerling Preis, Gr.2, Chantilly Prix La Moskowa, L, 3d Longchamp Prix Royal Oak, Gr.1, Prix Gladiateur, Gr.3, 4th Munich Grosser Muller Brot Preis, Gr.2. Golden Allez (Shirley Heights). 3 wins-1 at 2-at 1800m, 2400m, Milan Premio Naviglio, Rome Premio Caro, 2d Rome Premio Botticelli, L.
JULIETTE (Sadler's Wells). 2 wins-1 at 2-at 7f, 1½m, €85,374, US$12,332, Cork Give Thanks S., L, 2d Naas Noblesse S., L, 3d Curragh Finale S., L. Producer. Plato (Lure). 2 wins at 1m, 8¼f, 2YO S., 2d Belmont Lexington S., Gr.3. Sire. Race Record: 17 Starts 4-4-2 €16,250, A$178,650. 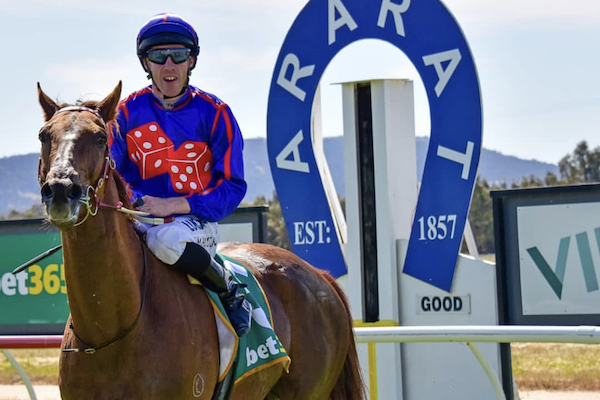 4 wins from 1500m to 2400m, €16,250, A$178,650, to 2017-18, MRC Le Pine Funerals H., SAJC Ubet Adelaide Cup 12/3 H., 2d TRC Hobart Cup, Gr.3, MRC Allan Wicks H., MRC (Mornington) Jack Dow Memorial H., 3d Maisons-Laffitte Prix Goodly, MRC Hamilton Reid H., 4th TTC Launceston Cup, Gr.3.